Space is the final human frontier, holding keys to further progress. To open new ways forward, diverse elements of science and engineering need to be combined organically. This requires leaders with high levels of expertise and broad knowledge who are active globally. Nagoya University is located in the Chubu Region, the center of Japan’s space industry, and our program takes advantage of the university’s location to produce international leaders who can integrate the latest findings and technologies on space with a broad perspective, and drive industry forward. Through the network of our graduates we aim to expand space utilization to help make people’s lives better, contribute to the development of the manufacturing industry, and lead to the creation of next-generation industry. Students develop steadily in an educational system emphasizing experience, as we nurture individuals with a strong pioneering spirit who can open new pathways to tomorrow. 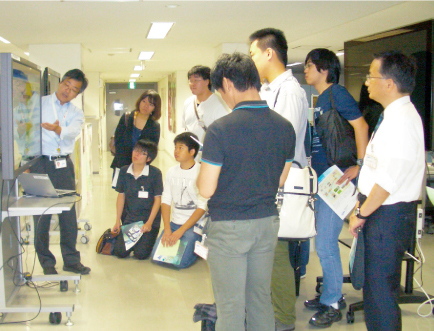 An industry-academia project, ChubuSat is being carried out in collaboration with industry in the Chubu Region. Taking advantage of the ChubuSat project, a joint industry-academia microsatellite project led by Nagoya University, students propose satellite instruments for development and carry out simulations, design, fabrication, environmental tests, preparation of installation, operation, and data analysis, experiencing every step from conception to completion. Unlike laboratory experiments with predetermined procedures, teams of 5–9 students from different fields work together to execute their projects through friendly competition and overcoming failures. Through cross-disciplinary interactions, students develop not only abilities that are useful in space-related industry, but also those that will be useful to them as leaders in the development of a wide range of industries, such as planning, project management and problem-solving skills. To develop the abilities needed by leaders through diverse experiences outside the university, students are required to complete an internship at one or more of our affiliated institutions including companies in Japan and other countries and international research institutions. In corporate internships, students acquire execution and problem-solving skills through experiences in practical environments that will help guide their career paths. In addition to aerospace, the companies that accept interns span a wide range of fields from general companies to mass media. This is an invaluable opportunity for students to get a feel for the type of people needed by companies, and at the same time for companies to experience the value of our doctoral candidates. In internships at research institutions outside Japan, students acquire international communication skills while experiencing global research environments. These international internships are planned by students themselves. planning and holding sessions to discuss and exchange opinions on various issues with faculty members, and various student-organized activities. Faculty members constantly monitor the activities organized by students, and assess student achievements, which cannot be measured by grades only, based on their leadership abilities and levels of contribution.